Meditations for Every Day of the Year. 365 sections taken from the Sermons from the Rev. J. P. Paauwe, 368 pages. Cast thy bread upon the waters - book 7. 16 sermons (7 about John 3:16), 182 pages. Cast thy bread upon the waters - book 8. 15 sermons (10 about Psalm 84:5-7), 175 pages. Cast thy bread upon the waters - book 9. 16 sermons (6 about John 21:15 and 10 about Psalm 25:4), 170 pages. 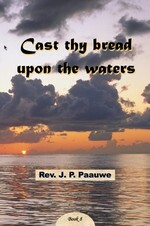 Cast thy bread upon the waters - book 10. 7 sermons about the prayer of king Asa (2 Chronicles 14), 76 pages. If you want to buy one or more of the above books you can send us an e-mail. For Dutch books see this page.